This horrifying Xenomorph homage to H.R. Giger—in particular, his indelible influence on the aesthetic of the Alien film universe—was created by Eva Taylor, a student of dramatic art (properties) at the National Institute of Dramatic Art in Sydney, Australia. 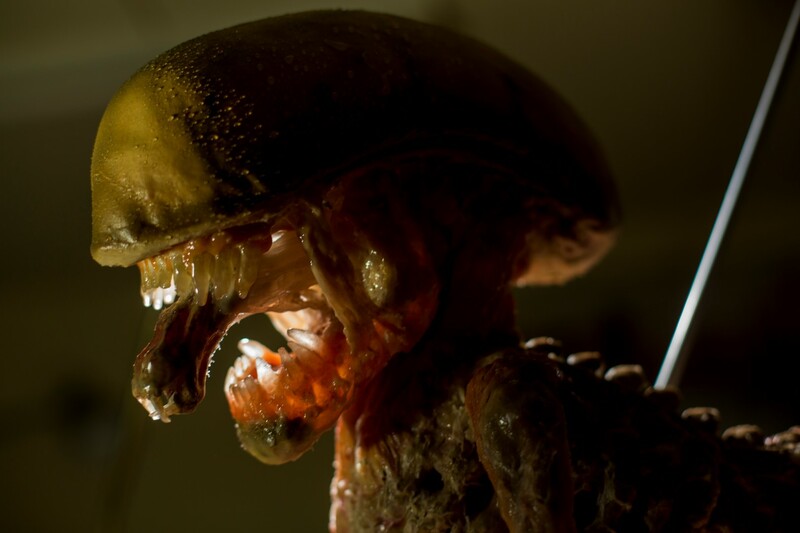 The hybrid animatronic-rod puppet draws its inspiration from the “bambi burster” (so dubbed by director David Fincher for newborn creature’s wobbly legs) designed and fabricated for the film Alien 3. Taylor’s work incorporates a variety of materials and techniques: the torso and limbs are hand-carved from Queensland maple; the limb joints are made from harvested and modified RC car and helicopter parts; the skull is cast from fiberglass and houses two actuators (one for the jaw and one for the tongue) and one servo (for the lips); and the tail contains custom laser-cut acrylic segments for an 8-way, 2-stage tentacle mechanism. 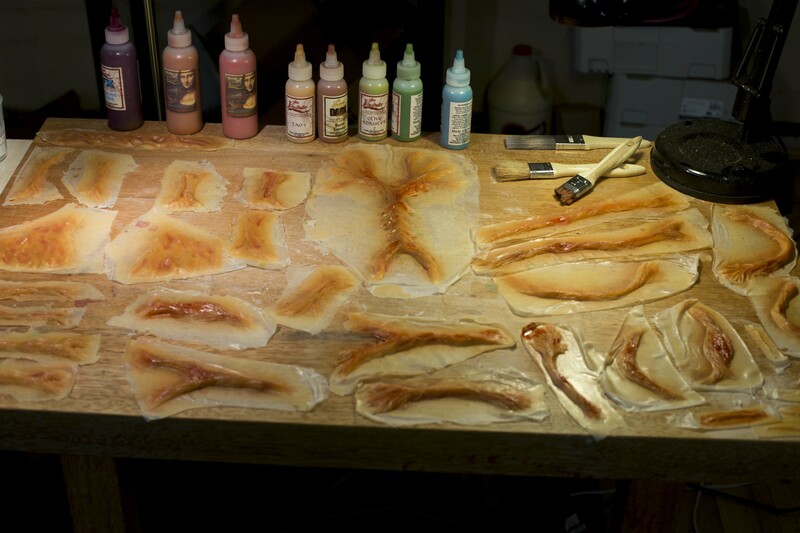 Finally, the creature’s body was coated in silicone and specialized muscle groups created in deadened, encapsulated silicone and airbrushed with Skin Illustrator pigments for a flayed look. The body, limbs, and pan and tilt of the head of the puppet are controlled by rods. 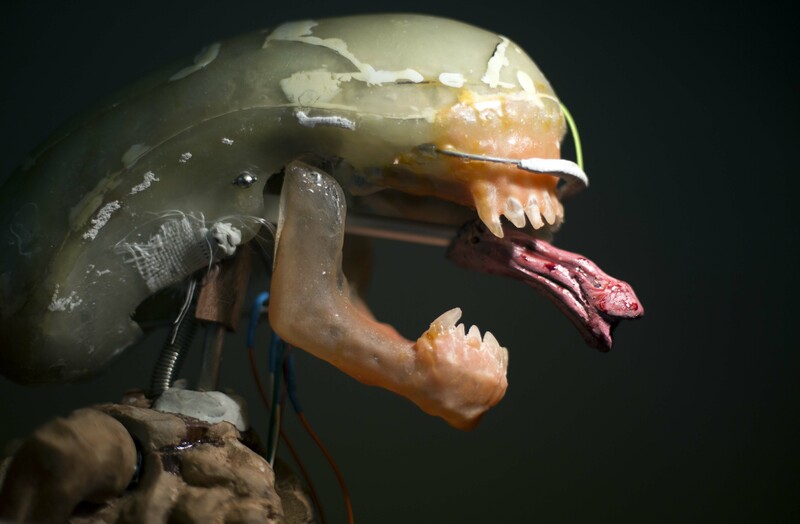 The animatronic components of the jaw, tongue, and lips are controlled by two PlayStation 3 controllers using the ServoShock module on an Arduino. And the tail is controlled by mechanical means. Taylor’s husband, David, filmed the making-of video highlighting a few aspects of the fabrication and directed a screen-test of what the creature would look like in a more dramatic piece. Details of the build are excerpted, with permission, from Taylor’s research dissertation, “Puppetry in the Alien Film Universe — The Adaptation of H.R Giger’s Biomechanical Surrealism and a Reimagining of an Alien Rod Puppet.” All photos courtesy David Taylor. Ten bones and four feet/paws needed to be carved in addition to the major torso. I dimensioned the stock using a planer before rough cutting all timber using a bandsaw and then moving to chisels to create the final shape. A dremel with a sanding bit proved useful for the final shaping. 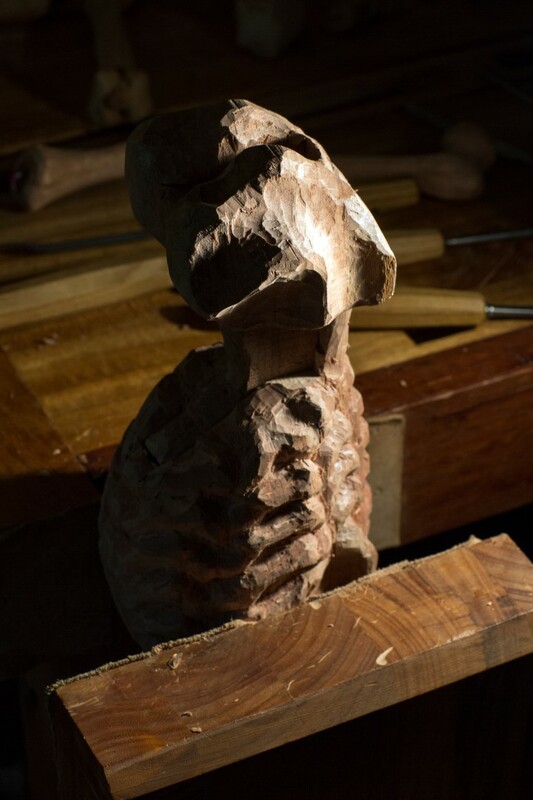 The torso proved to be the most challenging aspect, which was expected prior to commencement. It also took the most amount of time. Certain aspects needed more finishing, such as the depth of the trenches between the ribs in order for the ribs to stand out. 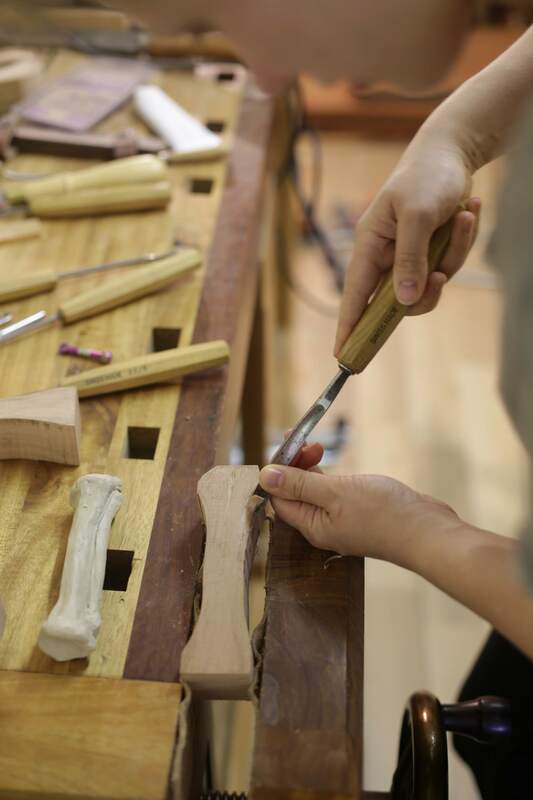 The sockets for each of the ball joints also had to be accurately carved. I ended up discovering very cheap aluminium parts on eBay, made in China for RC cars and planes. These parts included items such as “steering linkages” and “wheel assemblies” which I realised I could repurpose as a type of very small clevis joint. The original intent was for a fibreglass mould to be utilised for a resin underskull cast. While an underskull would have always been a necessity – the animatronic functions demand the space – it became apparent that the fibreglass mould could itself be used as an underskull foregoing the need for any additional resin casting. My choice for jaw material was hard, clear resin. Starting with clay, I modelled the teeth directly onto the underskull and jaw. After this, I took a silicone mould of the clay. Into the silicone I poured dental acrylic and after this set I used a soft dental acrylic to create the gums. Due to the tight spaces within the jaw, the tongue/secondary mouth was one of the last components to be fabricated. 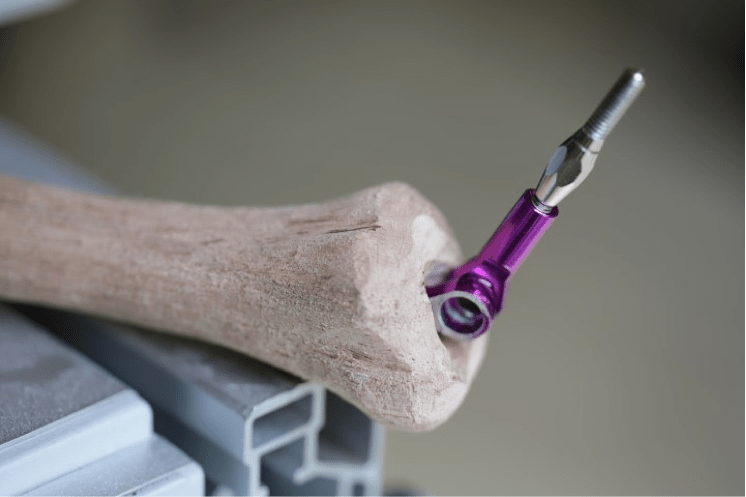 The [resin] cast tongue slotted in to the actuator arm and was fixed with a small screw to prevent it from detaching. Trial and error was used to achieve the correct positioning in the mouth. The skeleton of the tail consists, as mentioned above, of custom laser-cut acrylic parts. These parts include segments of vertebra in decreasing diameter and small extrusions. The vertebra have holes for 8 wires (in the case of the first 5 vertebra) and 4 wires (in the case of the last 5). Crucially, all vertebra segments have a hole in the centre for the “spine” to pass through. 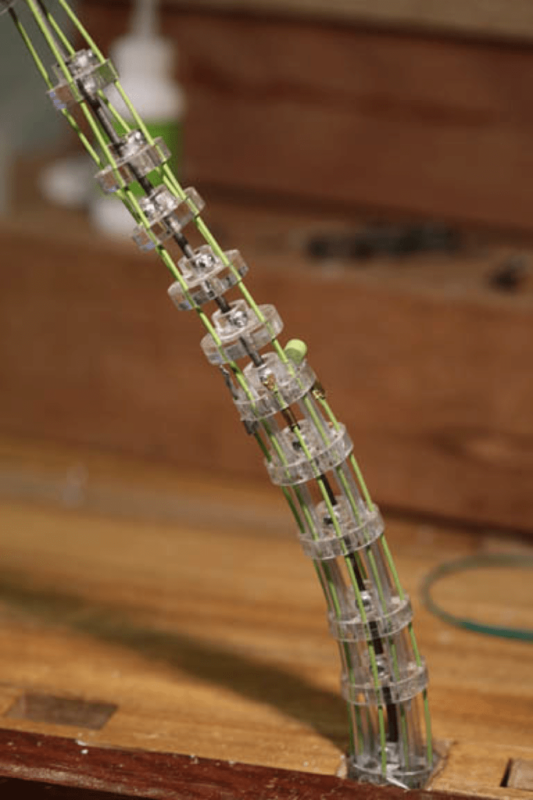 The “spine” was made out of car speedo cable that was salvaged for a spare parts yard. A speedo cable, as I discovered in the Stan Winston tutorial, is “counter-wound” meaning that it cannot twist on itself (which creates very unrealistic movement). Entirely coincidently, I stumbled upon a (successful) Kickstarter campaign for a short film titled He Took His Skin off For Me. This film consisted of a practical effect whereby the main character literally shed his skin, leaving the muscle groups exposed. Conveniently, the film’s makers also posted to their website a short tutorial on the techniques used to obtain this effect. I set about creating all the necessary muscle groups from clay, using reference images from canine anatomy. The clay was then used to create silicone moulds.